Conveying systems must meet the most stringent requirements for transporting hot materials safely and efficiently. 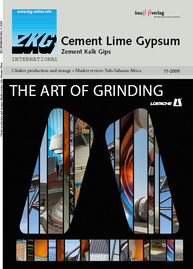 This especially applies to the transport of cement clinker. The clinker leaves the furnace cooling system at temperatures of up to 600 °C and is stored temporarily in the clinker silo. 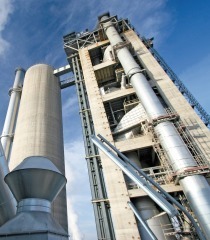 To ensure a trouble-free transport of the clinker, the conveying system must withstand these high temperatures. 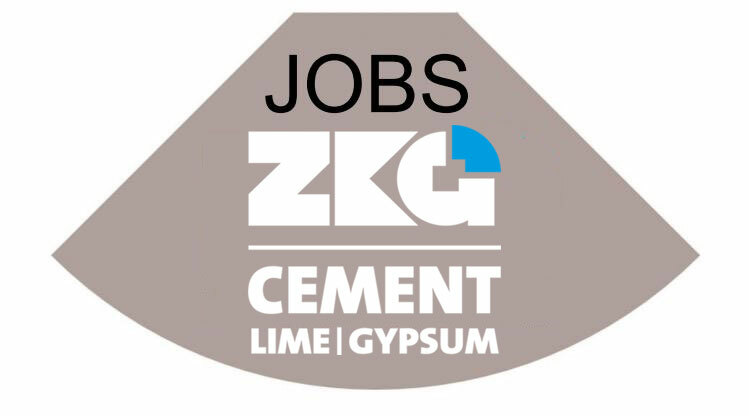 In addition, low purchase, operation and maintenance costs are an important factor in the cement industry. With its state-of-the-art belt apron conveyor, BEUMER offers an integrated solution which is tailored specifically to meet these requirements. 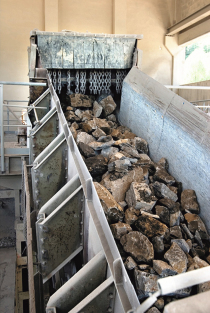 This solution is based on field-proven belts as used in our bucket elevators. Depending on the application, the purchase costs can be 5 to 20 % lower than for apron conveyors with chain. The cells transporting the hot material (Fig. 1) – which are traditionally moved by chain – move by belts that are reinforced by steel wires and can be supplied in widths ranging from 630 mm to 1400 mm. 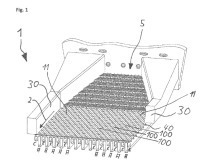 Plates are fastened to the outer sides of the cells to protect the belt from the hot material. Even if there is an unexpected material overflow on the belt in the material feeding area, the belt does not come into contact with the hot material. Compared to a chain, the belt has a lower weight which enables large lifting heights. 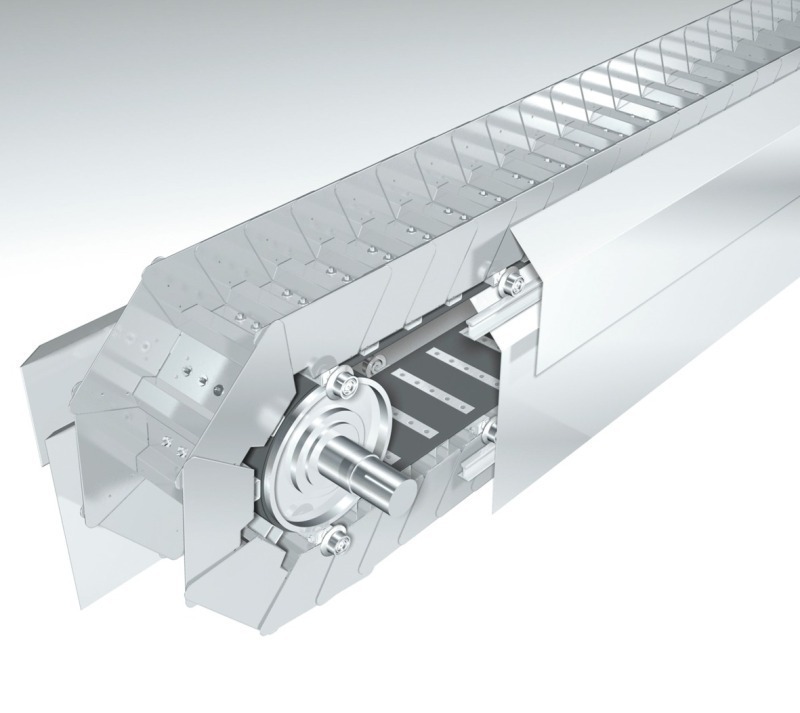 With up to 1300 m³/h and running speeds of up to 0.6 m/s, the belt apron conveyor reaches a high conveying capacity. 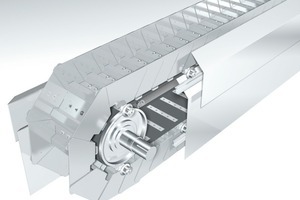 The entire belt lies with its surface on the drive and return pulley, thus, the unwanted polygon effect caused by the chain is avoided. This ensures quiet running and low noise emission, and avoids additional load by vibrations and noise to the plant and the adjacent buildings. Thanks to the compact and narrow design of the belt apron conveyor, the total project cost is reduced. The BEUMER belt apron conveyor enables angles of inclination of up to 45 °. The use of a belt avoids wear of the traction element. Lubrication of the traction element is not required. This represents a contribution to environmental protection. 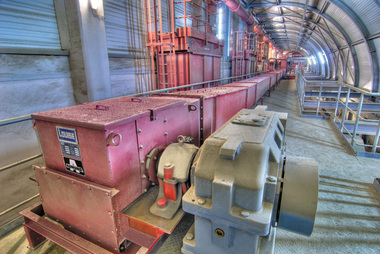 The belt apron conveyor is also first choice for system modernisations. Thanks to faster conveying speeds, higher quantities of material can be transported while keeping the existing conveyor frames and steel bridges.